Lean hog futures are one of the cattle futures contracts available for trading from the CME Group futures exchange. Lean hog futures make for a critical hedging instrument especially for market participants in the pork industry in an effort to manage the risks of price volatility which also attracts short term speculators as well. An important distinction to bear in mind is the terminology being used. Hog is a generic term for all swine including pigs, while pigs are referred to the young hogs. Hogs are descendants of the wild boar and they have been used by mankind since 5000 B.C. The first recorded incident was in China where they are said to have been first domesticated. Since the early days, the use of hogs has evolved. For one, hogs were a major source of food but over time, people started using the skin of the hogs to produce shoes and other materials while the bones were used either as weapons or in the manufacturing of weapons. Besides the above uses, hogs were also used in churning the ground and helping farmers in plowing the fields. Hog is referred to both the male and the female pig (barrow and gilt), raised for production of pork. Every year, over 100 million hogs are brought to slaughter as the pig farming industry has become intensive. Pork is one of the most widely consumed meats and the demand for pork has always outstripped the demand for other meats due to the fact that it was quite cheap. Lean hogs are the most common source for pork meat in the U.S but China tops the list when it comes to demand for pork meat. Trading lean hog futures is not as simple as trading currency futures or stock index futures and therefore requires the futures trader to know a bit about the industry in general and also some characteristics of trading that are unique only to lean hog futures contracts. 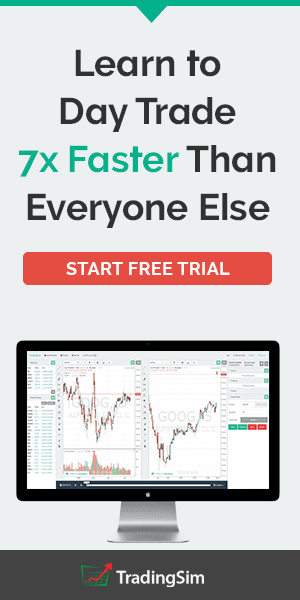 In this article, we cover the top seven things that you should know before you trade lean hog futures. Lean hog futures contracts are cleared on the CME Group exchange on the livestock futures complex, which besides lean hogs also covers live cattle, feeder cattle and pork belly futures. Lean Hog futures trade under the ticker symbol HE on Globex electronic exchange with each contract unit controlling 40,000 pounds or about 18 metric tons. 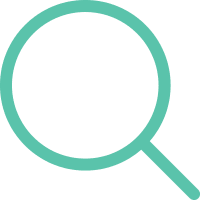 The minimum tick value is priced at $0.01 per hundred points, which brings it to about $4.00 per point for a standard contract. Lean hog futures pricing comes with a minimum tick size of $0.00025 per pound or about $10.00 per tick. 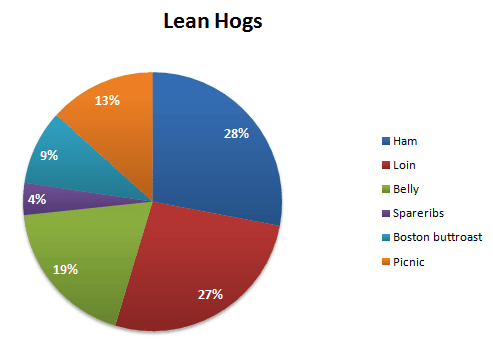 You can trade the lean hog futures on the contract months of February, April, June, July, August, October and December. The lean hog futures contracts can be price settled based on a two-day weighted average price from the United States Department of Agriculture (USDA) for the producer sold swine. 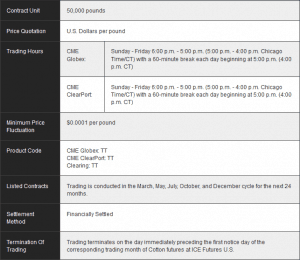 The table below shows a summary of the lean hog futures contract specification and trading details. The chart below shows an example of a typical lean hog futures price chart. Hogs have a short period of gestation which lasts on average about 3 and half months. Hogs are typically bred twice a year in order to ensure constant production flow. On average, a litter bears around 9 piglets. A month after birth, the piglets are weaned from the mother and raised on a special diet which ensures quick weight gain. Hogs can gain up to 3 pounds on every feed. By the time the piglets are 6-months old, they reach about 250 pounds in weight and ready for the butcher. A matured hog yields around 88 - 190 lbs. of meat that is categorized as suitable for consumption. Earlier, pork bellies were trading a separate contract on the CME futures exchange but trading was eventually discontinued on account of low trading volumes and liquidity. The remainder, jowl, fat and the remaining trimmings are used in other meat products or used as hide for the leather manufacturing. Some industry insiders often joke that every part of the hog is used except its "squeal." Lean hog production cycle is said to be highly cyclical with prices posting a peak around May and July months as the number of hogs in the market is at the lowest and meat producers start the procurement process and storage for the winter months. As with any commodity, lean hog futures price also depends on the underlying supply and demand factors. 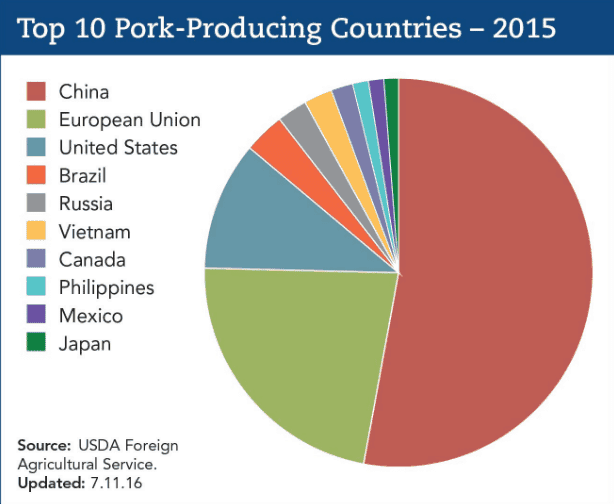 China and the U.S. rank on top of the list when it comes to production and supply of lean hogs. China's pork industry has been shifting from a market that was oversupplied to tight supply since 2014. In 2015 alone, it is estimated that pork meat imports rose by 34% on volume basis compared to a year ago. It is one of the world's largest consumer nations for pork and lean hogs by extension. Due to the tight supply, lean hog prices have continued to rise sharply with a 30% increase in prices on a year over year basis in early 2016. Demand for pork in China is however tied closely to the economy and also the seasonal patterns. It is said that demand for pork rises during January on account of the Chinese Spring Festival. Supplying China are Germany and Spain which have become the largest exporters within the Eurozone, which by itself accounts as one of the top three producer and consumer nations. In the U.S. lean hogs are exported to China alongside Mexico and South Korea, both of which make up for a significant export market for the United States. Among the many countries, China’s role in influencing the lean hog futures prices cannot be ignored. It is a producer and a consumer of pork. As one of the biggest consumer markets for pork products and according to one industry insider, the recent decision by China to drop the ban on U.S. pork imports from 16 plants was only evidence of more consumption to follow through. In 2013, China also bought one of the largest hog processing companies in the U.S., Smithfield Foods. Despite opposition to the sale, it was eventually approved by the U.S Congress. 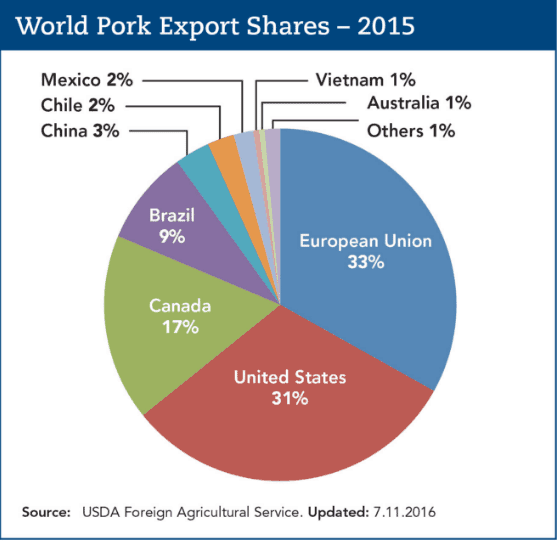 The U.S. ranks high as a pork exporting nation, which alone accounts for 31% and is second to the EU which accounts for 33% exports according to statistics from 2015. Epidemic and disease outbreaks are nothing new to the cattle industry including lean hog futures. These events tend to affect the production cycle quite sharply and can have a direct impact on prices of lean hog futures as a result. For example, in 2014, a virus outbreak called Porcine Epidemic Diarrhea hit the pig population. The disease damaged the guts in the pigs leading to severe dehydration and it impacted the piglets leading to high mortality rates. Over 7 million piglets across 30 states in the U.S. died on account of PED alone. As a perishable commodity, lean hog futures prices are very volatile and thus susceptible to diseases quite easily. According to some industry experts, it is estimated that the hogs industry is still paying the price of the PED virus from 2014, which only goes to show the seriousness of such factors which can impact the lean hog futures markets strongly. Disease is said to be the single biggest risk factor when it comes to lean hog production and one that also directly impacts the futures prices. Corn is one of the important commodities that are closely related to lean hogs. Corn is one of the primary feeds used during the fattening period of the piglets. Needless to say, corn prices impact the price of lean hog futures at some point in the production cycle. If the price of corn rises strongly, hog producers end up taking their hogs at lower weight to the market to avoid the high costs of the feed. Therefore, futures traders can see a trend between corn prices and lean hog futures prices, which develop over a period of time. The relationship between the two commodities are strongly intertwined that it has given rise to the hog-corn ratio. The Hog-Corn ratio divides the price of lean hog futures by the price of corn hog futures. Historically, the ratio was benchmarked at 20. A reading of above 20 suggested that pork production would exceed the previous year's levels in a 12 - 18 month time frame. Conversely, a corn-hog ratio below 16 indicated that production would decline over the coming 12 - 18 month period. Every quarter, the United States Department of Agriculture (USDA) releases the Quarterly Hogs and pigs report, which is a big market mover. The report summarizes data on the total U.S. hogs, or inventory, the breakdown of the market into several categories based on weight and other factors. It is important to keep in mind the quarterly dates when the report is published. The past quarterly reports and future release dates can be accessed from the USDA website here. Besides the quarterly report, the USDA also releases other key information such as the daily slaughter totals and the monthly Livestock Slaughter report for lean hogs. 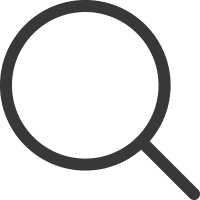 These reports give a fundamental overview on the supply and demand give a firsthand account of the market, which is useful for lean hog futures traders. Some of the important reports released by the USDA include the Economic Research Service, Livestock, Daily and Poultry situation, Monthly and Quarterly reports. Besides the USDA report, lean hog futures traders can also look to the weekly CFTC CoT Report which gives a closer look on the speculative and hedgers exposure to the commodity. 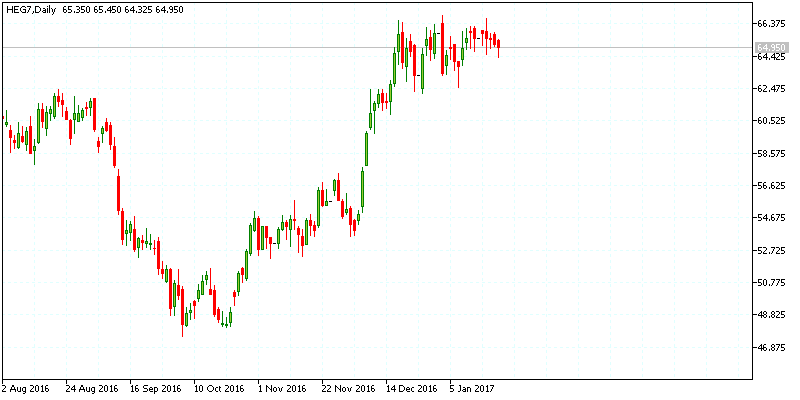 Besides the above factors, lean hog futures traders should also focus on a number of other things such as the U.S. dollar for example. Because lean hog futures are priced in U.S. dollar, a rising or a depreciating currency tends to impact price of commodities, lean hogs included. The currency's exchange rate is something that is beyond the control of both producers and merchants but its effects trickle down. A stronger dollar is known to limit exports while increasing imports of meats and vice versa. Trade deals are another factor. For example the proposed Trans-Pacific Partnership trade agreement is said to be a boon for hog producers with one expert on the subject going as far as calling the TPP the most important commercial opportunity ever for the hog industry. In conclusion, lean hog futures have several qualities that make it as a specialized commodity that is traded. Due to the widespread use of hogs in different products, ranging from barbeque to being critical elements in the medical industry, hogs as a commodity are always in demand. Specialized hog factories are production centers that allow the hogs to be reared with precision to the specified weigh and build. The production efficiency also means that rearing of hogs is done in a relatively short period of time. 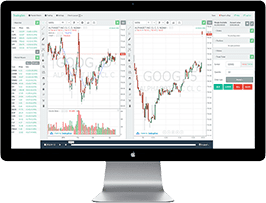 Lean hogs futures, although largely comprised of producers and merchants also has a significant amount of speculative trading activity as well due to the volatility, making it one of the well traded cattle commodities for the futures day trader.